During WW2 some of the Polish Army were stationed in Fife and I’m researching their presence for an exhibition later in the year. My father was in the 1st Polish Independent Parachute Brigade and I have a few of his old photos, like the one above. My father is second from right but I have no idea who the five others are or where the photo was taken. And I would love to know. If you have any information about this time, the Poles presence in Fife or photos that I might include in my work, please get in touch with me. ~ by marysia on 10 March 2011.
hi there my grandfather was in the 1st polish paratrooper brigade also his name was jan kirstein. sadly he passed away yesterday but if you have any old pictures of the camp that they were stationed in please can you email me copy’s??? i would love to see a picture with my grandad in it. very kind regards paul kirstein. All the group photos I have at the moment are on the blog. If you have a photo of your grandfather please send it and I can include it and look out for him. Which one is your granddad. I don’t have any of the names. My father is second from the right. Hi im almost sure he is 2nd left but im not 100% but it looks a lot like him and i also see a family resembalence . 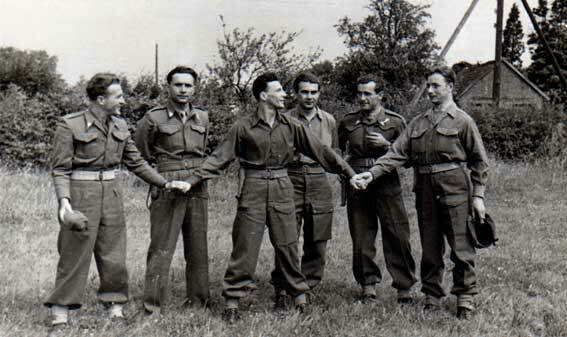 I am researching a member of the 1st Independant Polish Parachute Brigade who was in the 3rd Battalion. His name was Lt. Stanislaw Slesicki and was killed east of Driel on 22nd September 1944. His service Number was 4461 and he flew to Driel on chalk number 89. I have a picture of him in civilian clothes but not in uniform. Can anyone help me. The weather is fine once you get used to it. My father found it too cold too so moved down to London where I grew up. No. My father was Roman Lachowicz and my mother was fro, Pittenweem.